Use this fun session to keep your younger players in love with Tennis, whilst learning the basic skills! Cones (stations) are set on the player's side and the player starts from the first station. The coach feeds the ball to the first station and the player hits forehand. If the ball is hit inside the court player moves to the next station. Young players don't like to do the same activity for the long time so it is a challenge for a coach to modify the drill to meet this expectation. Hitting forehands from the same spot for few minutes will not motivate the young player, so adding progressive levels is a way to let young players go to the more difficult spot and try their best. In this drill, the player works on forehand's control from different spots on the court. By placing stations closer and further from the net, the player has to modify technique and decisions to maintain good results. 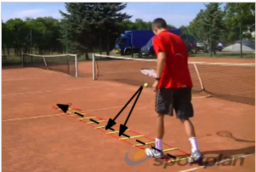 Closer stations will force the young players to shorten the backswing and just touch the ball while the furthest station can be achieved only when the racquet is accelerated.